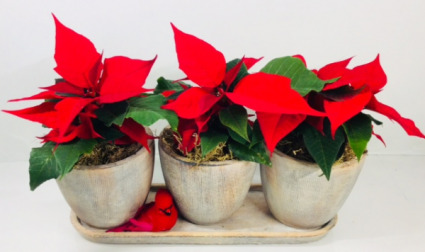 Nothing says Christmas like a bright red poinsettia plant! This has 3! They are 4" and set in ceramic pots on a ceramic tray. There is a red cardinal for an extra cheery touch! This arrangement is perfect for any occasion, very colorful and romantic and sure to be remembered! 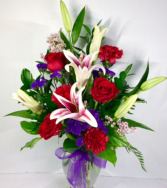 It is a glass vase filled with stargazer lilies, premium red roses, red carnations and beautiful filler flowers. To finish it off, it is adorned with an elegant sheer bow. 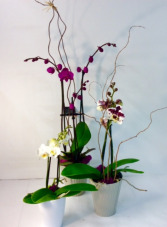 An elegant phalaenopsis orchid plant is a great gift to give for any occasion! It is perfect for a desk or table and comes in 3 sizes. The upgraded plants have curly willow branches. Price varies by pot size and stem count. 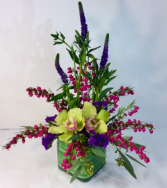 Brighten someone's day with this glass cube filled with cymbidium orchids, purple veronica and mixed fragrant filler flowers. Orchid colors vary due to availability.